Bath time usually signifies the end of the day and for children the undivided attention of a parent as well as lots of water equals fun. So if you can use this time to soothe their skin so much the better! As well as emollient bath treatments, there are alternatives that other people use to help reduce the symptoms of eczema. As always, no specific research suggests that any of these additives are clinically effective. We also do not recommend any particular treatment but are highlighting some of the options that people are known to try. Bath emollients are moisturisers which are added to the bathwater. They are commonly prescribed alongside regular emollient creams and are also available over the counter. However, recent research has questioned the effectiveness of these and it is likely that the prescribing guidelines will be updated to reflect this research in the near future. That said if, like us, you have a child who hates having anything smeared on their skin, bath emollients can be an effective way of getting at least some moisture into your child’s skin without an all-out battle before bedtime. Oatmeal is known for its moisturising properties, and it is believed to help reduce inflammation. Many people see success with an oatmeal bath, particularly for severe eczema flares. The best way to create an oatmeal bath is to add oats to a blender to form a powder and then add the oat powder to a clean cotton sock or a muslin bag (this reduces the amount of cleaning required). Add the sock when running a lukewarm bath and, hopefully, the child will experience moisturising properties from the oat soak. Itchy baby sell a great oatmeal based bath powder that can be added directly to the bathwater. 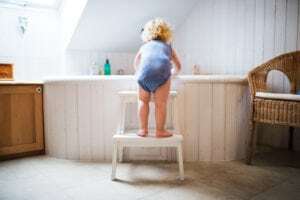 While adding carefully prescribed amounts of household bleach to a child’s bathwater sounds extreme, it’s actually no different from taking them to the local chlorinated pool. Research carried out by National Eczema Association suggest bleach baths reduce inflammation and itching, although interestingly they don’t appear to affect the bacteria on the skin. If you want to try bleach baths the NEA factsheet gives great instruction and guidance. A note of caution: concentrated bleach is nasty stuff and small children are magnets for danger. Get the bath ready and well mixed, check for any spillages and put the bleach bottle safely away before letting your little one into the bathroom. Some children may have a sensitivity to bleach and children with asthma may suffer a reaction to the fumes, in which case bleach baths should not be used. Bleach can also react to other ingredients, so it should be the only product in the bath. Another popular bath additive for eczema is coconut oil. Coconut oil is known for its moisturising properties and the fact that it can penetrate the skin barrier to give deeper moisturisation. It can also help those with eczema as it is antifungal and antimicrobial. Many people combine Epsom salt and coconut oil in a bath to help with both healing and moisturisation. The downside to coconut oil is that it is a tree nut and should not be used for people with tree nut allergies. 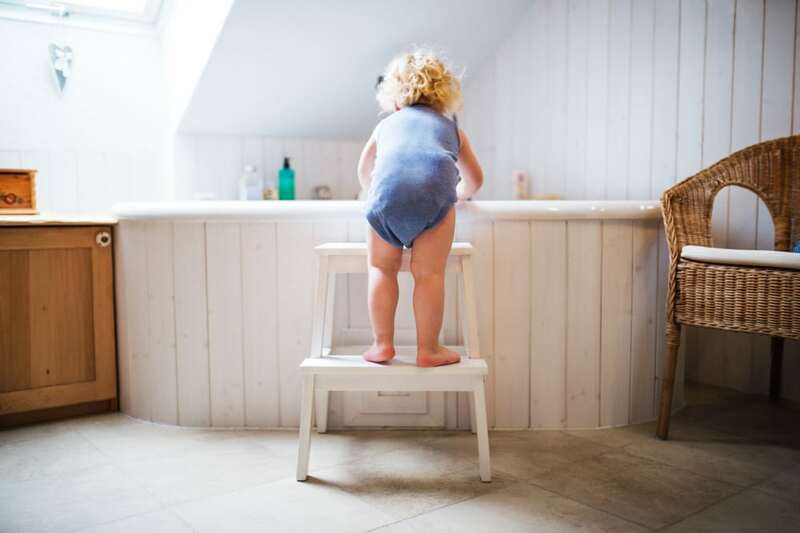 As with bath emollients, coconut oil can make both the bath and your child incredibly slippery. Just like coconut oil, apple cider vinegar is antifungal. The vinegar is also antibacterial and can control the pH of the water, through alkalisation, which can help to control the yeast levels in the skin which can help those with eczema. Some people are known to find this treatment beneficial as they believe it kills bacteria and boosts the immune system with its mineral salts. With this treatment, there is very little research, so any side effects or problems are not yet evident. Anecdotal evidence seems to suggest that apple cider vinegar can work well for adults with eczema on their face and necks but any beneficial effects are less marked in other cases. Table salt to simulate seawater conditions has been known to help some people with eczema to reduce the stinging during severe flares. This means that table salt may be helpful alongside other bath additives to help make the bath more comfortable for the child. Epsom salts are also a popular bath additive for eczema. It also creates a condition similar to seawater, and the level of magnesium can help with skin healing and soothing. For a child one cupful is enough. Many people believe Epsom salts are a natural and effective way to treat eczema, but as salts can feel drying on the skin after a bath, this treatment will need daily skin maintenance too, such as the soak and seal method. Basically soak and seal means you are locking in the moisture that a bath can give you. Leave the bath after no more than 15 minutes and pat the skin until it is damp before quickly applying your chosen topical medication. If itching of eczema is particularly bad, then some believe that baking soda, either in the bath or as a paste can help to relieve itching and prevent the itch/scratch cycle. Some recommend using it in conjunction with Epsom salts. Hopefully this post has given you some useful ideas and food for thought. As with any treatment, it is wise to seek medical advice first and only choose options which you and your child are comfortable with. So much is hearsay or word of mouth when it comes to alternative treatments for eczema. We would love to hear about whether bath additives have worked for you personally. Leave your comments below!